A group of beautiful 1890’s silk skirts. 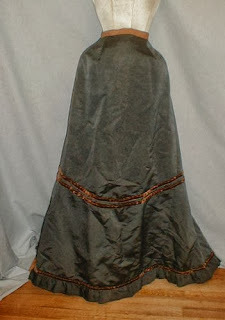 The first skirt is made of gray silk and trimmed with brown velvet ribbon. The second skirt is made of green and black floral brocade fabric. It has a long back sweep. 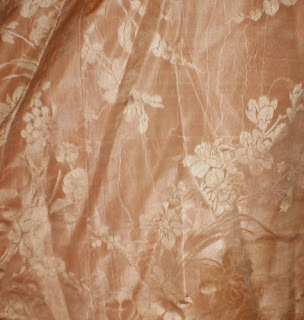 The third skirt is made of gold floral silk brocade. The skirts are all in very good condition. The gray skirt has no holes or splits. It has a couple of pencil tip size soil marks. The green and black brocade skirt has no holes or splits. There are loose pleats at the back waist that will need minor re-stitching. The gold skirt has a few pencil tip size holes, an 8 inch drip mark and a couple of ½ inch drip marks. Measurements for gray skirt: Waist 26 length 41. 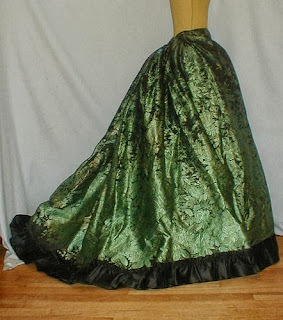 Measurements for green brocade skirt: Waist 26 Front length 42 back length 50. 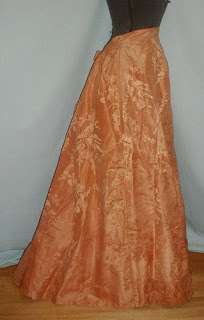 Measurements for gold brocade skirt Waist 26 Length 40. 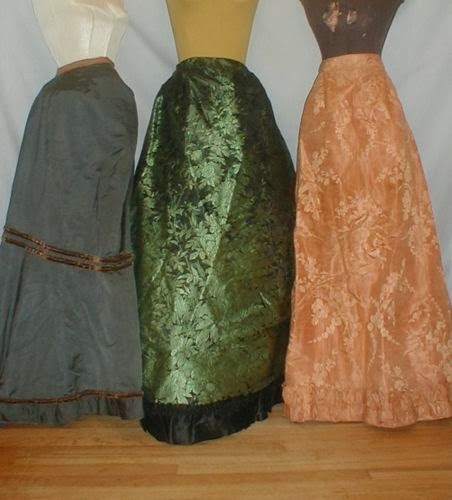 The Gray/Brown one is most likely from the 1870's, the green one is from the 1880's, and the peach one is from the 1890's.